Litho-fluid models from DUG Distill can be incorporated into crossplots. This can be a valuable tool when differentiating stratigraphy and identifying lithologies in the crossplot. Open the LithoFluid Model tab. Select a single litho-fluid model (.dustat) or an interface model (.dupdf). Models must be loaded into Insight in the Control Panel > QI tab (see Importing a LithoFluid Model/PDF). See the next sub-section for using intercept and gradient PDFs. PDF attributes: Select the distribution from the model to plot. These should correspond to the selected horizontal and vertical crossplot volumes. Tip: Multiple ellipses can be displayed. To deselect all, right-click a selected depth and choose Deselect All. Export crossplot data: Export crossplot ellipse points as a .tsv text file (with or without source coordinates). Tip: Click the circle at the bottom of the Litho-Fluids model to show/hide all the ellipses. Display style of the ellipses is controlled from the View tab (see Configuring Crossplots). Note: When highlighting geobodies and ellipses overlap, entries at the top of the list take precedence over lower ones. 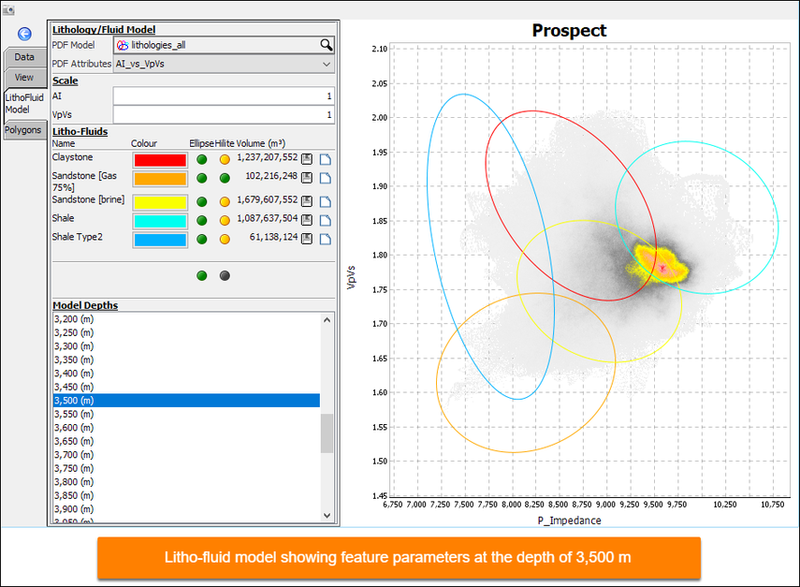 Litho-fluid interface models (intercept and gradient) from DUG Distill can be displayed in crossplots. 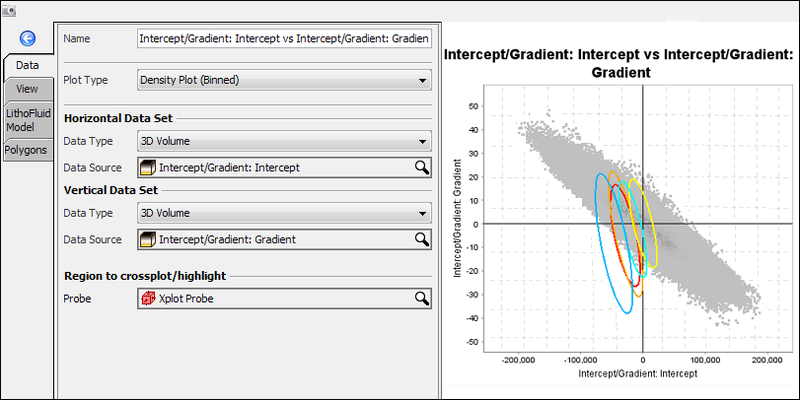 To generate the intercept and gradient volumes in Insight, see Intercept/Gradient. Gradient volume: vertical data set. Note: Right click and select Zoom to fit to ensure active ellipses are visible in the window.